On March 19 and 20 a group of 10 young farmers from the Alsace region of France (Les jeunes agriculteurs d’Albestroff) visited Northern Ireland following an invitation from James Campbell of Lisburn. Their members were from dairy, organic dairy, beef, mixed farming and engineering backgrounds. The group had travelled north after enjoying the St Patrick’s celebrations in Dublin and were treated to visits to Draynes Dairy Farm, Lisburn, where they saw the production of milk through to value added products such as ice cream. The visitors then moved to Eglantine Farm Produce, Lisburn, for an excellent visit hosted by John Sloan on the production and packaging of various root crops. The day culminated with dinner in Belfast to sample some fine Northern Ireland steaks. 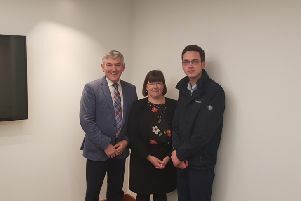 The second day started with a brief visit to Ballymena Livestock Mart for the sheep sales and lunch and ended with a scenic trip over the Glenshane Pass to New Buildings where Fleming Agri Products gave an enjoyable and informative tour of the production facilities and product line-up.